Mohammad Younis Khan (Pashto, Urdu: ???? ???? ???) (born 29 November 1977) is a Pakistani cricketer and former captain of the Pakistan national cricket team. Younis name is often spelled Younis Khan, but he has been quoted as saying that he prefers the spelling "Younus". He is only the third Pakistani player to score 300 or more runs in an innings. Like Imran Khan, he is most remembered for his leadership letting Pakistan win 2009 ICC World Twenty20. He also holds the most centuries by a Pakistani cricketer in test cricket. On 10 March 2010, Younis, along with another player, Mohammad Yousuf were axed by the Pakistan Cricket Board from playing for Pakistan in any format for an indefinite period, following an inquiry report which suggested that both players were involved in breaches of discipline by inciting divisions within the team. The ban was lifted three months later. Presently Younis is a key member in the ODI and Test match side. By 22 October 2014, Younis reached his 25th test match century against Australia and made his 26th century in the 2nd innings of the same test match, the highest number of centuries of a Pakistani Batsman and the only sixth Pakistani batsman to hit centuries in both innings of same test match. Younis Khan made his international debut in an ODI against Sri Lanka at Karachi in February 2000, and has since played over 150 ODIs for Pakistan. He has also played in over 90 Test matches. Younis was one of the few batsmen who retained his place in the team after Pakistans disastrous World Cup campaign in 2003, but lost it soon after due to a string of poor scores in the home series against Bangladesh and South Africa. He came back for the one-day series against India, but failed to cement a place in the Test side. Apart from being an accomplished batsman, Younis is also a skilled slip fielder and a very occasional leg-spin bowler. Once, Craig McMillan hit Younis for 26 runs, 4 4 4 4 6 4 in an over, a then world record, during 3rd Test at Westpac Trust Park, Hamilton. He has performed particularly well on foreign grounds, including on tours of Australia, India, England and Sri Lanka. In the six Tests he has played against India, Younis averages an exceptional 106, the highest average against India by a Pakistani cricketer. Apart from his 267 at Bangalore, Younis also made 147 at Kolkata in 2005 and a pair of centuries during Indias trip to Pakistan in 2006. More importantly, the tour to India also showcased his potential as a future captain of Pakistan and his energetic and astute leadership has impressed many people. Also in 2006, Younis made a century in the third Test against England at Headingley. On 22 January 2007, he scored a matchwinning 67 not out in the 4th innings to guide Pakistan to victory over South Africa in Port Elizabeth. The five wicket win levelled the series at 1–1. He first led Pakistan against the West Indies in 2005. In September 2006, he was offered the position of captain for the 2006 ICC Champions Trophy, following the suspension of Inzamam ul Haq. He turned down the offer, stating he did not want to be a "dummy captain". However, on the morning of 7 October 2006, the Pakistan Cricket Board announced that Khan would lead his team in the tournament. Following the resignation of Inzamam after the Pakistans exit from the 2007 Cricket World Cup, Khan was offered the captaincy on a permanent basis, but he turned it down. He blamed the angry reaction by the Pakistani public to the teams early exit from the tournament. Khan resigned as captain on 13 October 2009 due to a parliamentary investigation into match fixing that was alleged to have taken place during his reign. Despite being cleared in the investigation, Khan said "Yes I have submitted my resignation because I am disgusted by these match-fixing allegations made against me and the team." In 2008–09, Younis is playing for the Southern Redbacks in Australias domestic circuit on a short-term basis. He scored a century against Queensland Bulls in the first innings of a Sheffield shield match in Brisbane, which helped the Redbacks to win their first Shield match for a year. 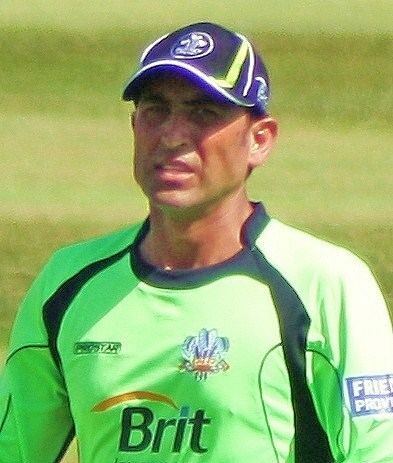 In 2005, Younis played county cricket for Nottinghamshire in England. In the 2007 English domestic cricket season, played for Yorkshire County Cricket Club as an overseas player. In doing so he was the third overseas Asian cricketer to play for Yorkshire following Sachin Tendulkar and Yuvraj Singh, and was succeeded by Pakistani player Inzamam-ul-Haq. Younis is regarded as one of the best players of spin bowling in the world, being particularly strong on the leg side. His favourite and trademark shot is the flick, but it has also been his shortcoming, with him being particularly prone to falling lbw during the early stages of his innings. He is also prone to getting down on one knee and driving extravagantly. But this flamboyance is coupled with grit. One of his main weaknesses is playing away from the body, he also has a tendency to leave straight balls, a trait that has been exploited by bowlers in the past, particularly by the Australian attack. Along with Mohammad Yousuf and the now retired Inzamam-ul-Haq, he formed a formidable middle order batting line up for Pakistan. Younis is a skillful infielder, with a report prepared by Cricinfo in late 2005 showing that since the 1999 Cricket World Cup, he had effected the third highest number of run-outs in ODI cricket (joint with Andrew Symonds), with the highest success rate. Best player of sweep against spinners in modern cricket. Younis Khan married Amna on 30 March 2007, and their son Owais was born on 26 December 2007. Younis had to deal with a number of deaths in his family during 2005 and 2006. Earlier in 2005 he had to fly back from a tour to Australia after his father had died. Later in the year during Englands tour to Pakistan, Younis eldest brother, Mohammed Sharif Khan, aged 41, died in a car accident in Ukraine who, in Youniss words, taught him to play cricket. Another older brother, Farman Ali Khan was only 39, when he was killed in a car accident in Germany, in December 2006.